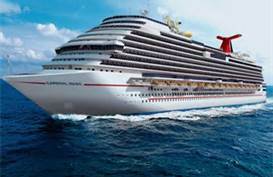 Have an Unforgettable Carnival Magic Cruise! Your family will have nonstop fun aboard a Carnival Magic cruise to the Caribbean. The ship is quite impressive and will leave you wanting more. 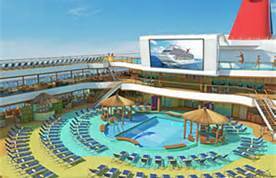 The Magic is a sibling to Carnival Dream - the Dream Class of ships - Carnival Cruise Lines' biggest ships featuring state of the art amenities for all to enjoy. 1. "Just got off one Magic cruise and booked another 2 weeks later. It's an amazing ship and holds up to its name. Trust me." 2. "Carnival Magic instantaneously became one of the coolest ships on the high seas..."
3. "We had a good time. The room stewards were the best..."
4. "I am a converted cruise addict. Based on the cruise I would recommend everyone try cruising..."
1. "I expected a great cruise. Bigger is not necessarily better." 2. "Carnival Magic March 2013 not so great..."
The Magic has extensive children's facilities, which include expansive play areas and a gigantic Carnival WaterWorks aqua park with two huge slides. Expect to enjoy the Seaside Theatre, a massive two-decked Cloud 9 spa and the "new" SportSquare outdoor recreation area featuring the first ropes course at sea and a two-level mini-golf course. Wow! For your sleeping pleasure, there are specially designed cabins for five with two bathrooms. This is super cool! At night go dancing, watch movies under the stars, or enjoy a professionally choreographed theater production. Be sure to check out the new Cucina Del Capitano, an Italian restaurant serving handmade pastas. For those who drink, you will want to check out the RedFrog Pub, a Caribbean themed watering hole serving its own home brew. There is just too much fun stuff to do on a Carnival Magic cruise. At the time of writing this, the Magic is based in Port Canaveral (near Orlando) and offers cruise packages to the Eastern and Western Caribbean. Carnival Magic also offers some sailings out of Miami. 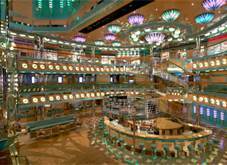 The ports of call included in a Carnival Magic itinerary are among the hottest spots in the Caribbean. Expect to visit places like Nassau, Bahamas; St. Thomas, USVI; San Juan, Puerto Rico and Grand Turk, Turks & Caicos Islands on an Eastern Caribbean cruise. 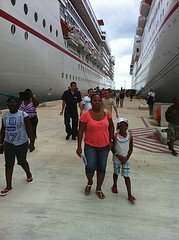 You will also enjoy ports of call such as Cozumel, Mexico; Grand Cayman, Cayman Islands; and Mahogany Bay, Honduras on a Western Caribbean cruise. The Magic offers 7-day cruises to the Caribbean, and your family should be able to find a cruise year-round. There are 7 Night Eastern Caribbean Cruises to Amber Cove, Dominican Republic; San Juan, Puerto Rico; St. Thomas, USVI; and Grand Turk, Turks & Caicos Islands. There are 7-night cruises to Grand Cayman, Cayman Islands; Mahogany Bay, Honduras; Belize City, Belize; and Cozumel, Mexico. Note: The itineraries above are subject to change at anytime. As noted before, a Carnival Magic cruise is available just about anytime of the year. Get with your Travel Agent, or use the search bar below to book. 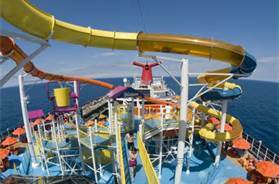 Your family will have fun-times on board this remarkable Carnival cruise ship!